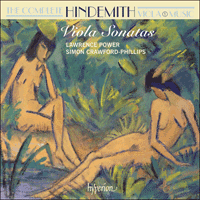 Lawrence Power, Britain’s acknowledged greatest living performer on the viola, turns his attention to an incalculably important body of work for the instrument: a complete survey of Hindemith’s music for viola. Hindemith himself was an internationally renowned violist and gave the premiere of Walton’s Viola Concerto, writing more solo repertoire for the viola than for any other instrument. Hindemith is a genuinely undervalued composer, with a popular impression of his music as uncompromisingly gritty which will be proved by this series to be entirely undeserved. The Viola Sonata in F major Op 11 No 4 is a graceful and charming work that may surprise those who are only aware of Hindemith’s place in the European avant-garde. The stunningly melodic opening of the first movement and the lullaby-like tune which features in the Finale comprise some of the most romantic music the composer ever wrote. The Sonata Op 25 No 4, written only three years later, shows the development of Hindemith’s style in the intervening period: an altogether tauter construction, in the leaner, rhythmically highly directed idiom that had rapidly evolved in those years. The piano plays an unusually prominent role. The Meditation for viola and piano of 1938 is a transcription of a peaceful movement from his ballet of the same year about St Francis of Assisi, Nobilissima visiona, depicting the saint at prayer: it will be familiar to concert-goers as the opening portion of the orchestral suite that Hindemith also fashioned from the ballet. The music is a kind of distillation of his mature idiom, gravely flowing and serene. Paul Hindemith’s first instrument was the violin, and so thoroughly did he master it that he rose to become leader of the Frankfurt Opera Orchestra at the age of nineteen. But by the end of World War I he had turned in preference to the viola, and in the inter-war period he was internationally renowned both as a chamber-music player—he was the violist of the Amar Quartet, which specialized in contemporary music—and as a concert soloist. (He gave the premiere of William Walton’s Viola Concerto, for example.) He probably wrote more solo repertoire for the viola than for any other instrument. In addition to a concerto (Der Schwanendreher), two other concerto-like works (the fifth Kammermusik and the second Konzertmusik), and the Trauermusik for viola and strings, he wrote no fewer than seven sonatas, either for viola and piano or viola unaccompanied. The first examples of these latter categories are the fourth and fifth, respectively, of the five stringed-instrument sonatas which he began in 1918 while still serving in the German army on the Western Front and published together as his Opus 11. At that time it was an almost unheard-of gesture to group together so many works as subdivisions of a single opus, and it indicated Hindemith’s desire to put away Romantic attitudes, such as the idea that every composition was a complete and utterly separate work of art. Admittedly Brahms and Reger had sometimes published chamber works in pairs, but by encompassing such a large number of fair-sized works Hindemith was going back to the examples of Haydn or even Handel, providing a collection from which performers might choose. On 2 June 1919, partnered by his pianist friend Emma Lübbecke-Job, he premiered the Sonata in F major Op 11 No 4 for viola and piano as part of an all-Hindemith concert in his home town of Frankfurt. The concert led directly to the work’s publication, and a connection with the publishing firm of Schott that lasted the rest of Hindemith’s life. Though not without original touches, this graceful and amiable sonata is one of few works which hints at the source of Hindemith’s style in the sound-world of Brahms and even Dvorák. There is also a Franco-Russian strain, perhaps heightened by a study of Debussy (whom his wartime commanding officer had especially admired). Little in the sonata’s musical language would have caused surprise in the 1890s, though few pieces of that era modulate so freely. The rather unusual form, with a short introductory movement, a theme and variations, and a finale that interrupts the variation-sequence only to resume it later, suggests the genre of fantasy-sonata cultivated by some of the Romantic composers. The first movement’s lulling initial melody might almost be by Brahms, though the chromatic harmonization of its counter-statement points to César Franck. A cadenza-like passage leads into the variation movement, whose folk-song-flavoured theme is rather redolent of the Russian nationalist school (Borodin, say, filtered through Debussy). The ensuing four variations are more individual, however, with the part-writing turning increasingly into real polyphony. The finale disrupts the process: it resembles a self-contained sonata-form movement with two contrasting ideas—the first assertive, with a prominent three-note rhythmic figure, and the second a gentle, lullaby-like tune, one of the most frankly Romantic melodies in Hindemith’s entire output. After an extended development, however, the sequence of variations begun in the previous movement resumes with a final group of three: one gently flowing, a livelier fugato, and a coda where the folk-song-like theme has the last word. Only three years separate Op 11 No 4 from Hindemith’s next viola sonata with piano, the fourth member of his Op 25 set (it still was his practice at this period to group several string sonatas together in a single opus). Yet while the Sonata Op 25 No 4 for viola and piano, composed in 1922, is technically still an ‘early’ work, every bar, at least of the first two movements, is echt Hindemith. In the meantime he had leapt to prominence in the European avant-garde with a scandalous trilogy of short operas dealing with eroticism from different perspectives, and had then almost immediately renounced their sensationalist style for a new ‘objectivity’ owing much to the Baroque composers. Unlike the F major Sonata’s virtual continuum of development from one movement to the next, therefore, the new sonata’s movements are highly contrasted and defined: this is an altogether tauter construction, in the leaner, rhythmically highly directed idiom that had rapidly evolved in the intervening years. The piano plays an unusually prominent role, opening the first movement with an extended solo of its own before the viola joins it for a driven Allegro with a gentler, but hardly much more peaceful, second subject. The evaporation of this energy into the sudden understatement of the coda is all the more unexpected—as is the eloquence of the slow movement, a kind of impassioned monologue for the viola against tolling piano chords: sometimes bell-like, sometimes like a chorale. The finale bursts in with brusquely percussive gestures in both instruments, developing into a determined and exhilarating moto perpetuo. This is imbued apparently (and for Hindemith unusually) with extended references to Eastern European music. One feels his contact at contemporary music festivals with the brilliant chamber works of Kodály and Bartók had temporarily rubbed off on him. Perhaps he realized this, for the movement is virtually unique in his output; it may be why he allowed this—in every other respect magnificent—sonata, alone of the Op 25 group, to languish unpublished during his lifetime after he gave the first performance in January 1923. Hindemith did not return to the viola/piano genre for seventeen years—with the two minor exceptions of the piano version of his Trauermusik (1936) in memory of King George V, and the Meditation for viola and piano of 1938. This latter piece is a transcription of a peaceful movement from his ballet of the same year about St Francis of Assisi, Nobilissima visione, depicting the saint at prayer: it will be familiar to concert-goers as the opening portion of the orchestral suite that Hindemith also fashioned from the ballet. The music is a kind of distillation of his mature idiom, gravely flowing and serene, the harmony fusing major and minor into a richly elegiac sonority. Nevertheless, this was an immensely productive period. As well as working on a projected Breughel ballet which became the piano-concerto-like Four Temperaments, he orchestrated some of his Marienleben songs of 1922–3 and began planning Die Harmonie der Welt, an opera (destined to remain uncompleted for nearly twenty years) on the life of the astronomer Kepler during the Thirty Years’ War. Meanwhile he produced a veritable stream of instrumental sonatas: one each for horn, trumpet, harp, violin, viola and clarinet, continuing a series originally begun in 1937 with sonatas for organ, piano duet, oboe and bassoon. He seems to have been reassessing the expressive potential of the various solo instruments; and indeed several of these sonatas possess a tension and drama very different from the harmonious serenity of Nobilissima visione. So it was during his third concert tour of the USA, in the early months of 1939, that Hindemith composed his third and largest Viola Sonata (which was also his last composition for the instrument as a soloist). This four-movement Sonata for viola and piano, which he premiered at Harvard on 18 April 1939, has unexpected affinities—from the standpoint of Hindemith’s most mature idiom—with the early F major Sonata, insofar as it possesses a ‘Phantasie’ movement, the finale includes two variations, and the work itself is more or less centred on F, though neither major not minor but a continual blend of the two. (In fact the work has no declared key-signature, and as a result has sometimes been incorrectly designated as a ‘Sonata in C’.) On the other hand it speaks entirely with the voice of the mature Hindemith, in strong, confident and sustained polyphonic lines. The determined and ardent first movement has an overall sonata shape, with a more tranquil subsidiary theme; working to an impressive climax, it displays the increased emotional warmth typical of Hindemith’s works of the late 1930s, a quality which indeed informs the whole sonata. There follows a powerful Scherzo, playing with rapidly changing lengths of bar, and with an emphatic rhythmic tag which Hindemith develops with great resource and sardonic wit while the piano contributes fanfare-like figures and perpetuum mobile accompaniments, or sinisterly stalks the viola in staccato. The ‘Phantasie’ slow movement proves to be a rhapsodic and increasingly dramatic blend of recitative and arioso, the viola now well to the fore. The finale begins affably enough, and its second subject emerges as a miniature march. But instead of a conventional development these materials are treated in two highly contrasted variations, the first mysterious and capricious, the piano contributing bird-like warbles and runs, the second more decisive and vigorous, sweeping the sonata to a triumphant conclusion on a unison F.
Le premier instrument de Paul Hindemith fut le violon, qu’il maîtrisa au point de devenir premier violon de l’orchestre de l’Opéra de Francfort, à l’âge de dix-neuf ans. Mais à la fin de la Première Guerre mondiale, il se mit à préférer l’alto et devint, dans l’entre-deux-guerres, un chambriste—il fut l’altiste du Quatuor Amar, spécialisé dans la musique contemporaine—et un concertiste solo de renommée internationale. (Il créa ainsi le Concerto pour alto de William Walton.) Il dédia probablement plus d’œuvres à l’alto qu’à tout autre instrument, signant un concerto (Der Schwanendreher), deux partitions concertantes (la cinquième Kammermusik et la deuxième Konzertmusik), la Trauermusik pour alto et cordes, plus un total de sept sonates pour alto et piano ou pour alto solo, dont les premiers exemples sont respectivement les numéros 4 et 5 des cinq sonates pour instruments à cordes entreprises en 1918 alors qu’il servait encore dans l’armée allemande, sur le front Ouest—elles seront publiées sous le numéro d’opus onze. Jamais personne ou presque n’avait encore considéré un si grand nombre de pièces comme autant de subdivisions d’un même opus et, par ce geste, Hindemith entendait rejeter les attitudes romantiques voulant, par exemple, que toute composition fût une œuvre d’art complète, à part entière. Certes, Brahms et Reger avaient parfois publié deux œuvres de chambre ensemble mais, en réunissant autant de pièces relativement imposantes, Hindemith rejoignait l’exemple de Haydn, voire de Haendel, avec un recueil où les interprètes pussent puiser. Le 2 juin 1919, accompagné de son amie pianiste Emma Lübbecke-Job, il créa sa Sonate en fa majeur op. 11 no 4 pour alto et piano. Cette première eut lieu dans son Francfort natal, dans le cadre d’un concert qui lui fut entièrement consacré et qui déboucha sur la publication immédiate de l’œuvre par Schott—une maison d’édition à laquelle il demeura fidèle toute sa vie. Émaillée de touches originales, cette charmante et aimable sonate est cependant une des rares œuvres où Hindemith laisse transpirer les sources stylistiques que furent pour lui les univers sonores de Brahms et même de Dvorák. Un accent franco-russe se fait également entendre, peut-être exacerbé par une étude de Debussy, que vénérait le commandant de Hindemith, pendant la guerre. Le langage de cette Sonate dut peu surprendre dans les années 1890, même si rares furent les pièces de cette époque à moduler si librement. Sa forme assez inhabituelle—un court mouvement introductif, un thème et variations et un finale interrompant la variation-séquence pour mieux la reprendre plus tard—suggère une fantaisie-sonate, un genre cultivé par certains compositeurs romantiques. La berçante mélodie initiale du premier mouvement pourrait presque être de Brahms, bien que l’harmonisation chromatique de sa contre-exposition évoque César Franck. Un passage façon cadenza mène au mouvement-variations, dont le thème folklorisant est plutôt renouvelé de l’école nationaliste russe (Borodine, disons, filtré à travers Debussy). Les quatre variations suivantes sont toutefois plus singulières, la conduite des parties tournant de plus en plus à la véritable polyphonie. Le finale vient rompre ce processus: il ressemble à un mouvement de forme sonate autonome, marqué par deux idées contrastives—l’une péremptoire, avec une saillante figure de trois notes, l’autre un doux air façon berceuse, parmi les mélodies les plus ouvertement romantiques de tout Hindemith. Mais, passé un développement prolongé, un dernier groupe de trois variations vient reprendre la séquence entamée dans le mouvement précédent: une au flux paisible, un fugato plus enjoué et une coda où le thème folklorisant a le dernier mot. Trois petites années séparent l’op. 11 no 4 de la sonate pour alto et piano suivante, la quatrième œuvre de l’op. 25 de Hindemith (qui regroupait alors encore plusieurs sonates à cordes dans un même opus). Techniquement une page de «jeunesse», cette Sonate op. 25 no 4 (1922) pour alto et piano est pourtant, dans chacune de ses mesures (du moins dans celles des deux premiers mouvements), du pur Hindemith. Entre-temps, ce dernier était soudain devenu célèbre dans l’avant-garde européenne grâce à une scandaleuse trilogie de courts opéras traitant de l’érotisme sous différents éclairages, dans un style sensationnaliste qu’il avait presque immédiatement abandonné pour une nouvelle «objectivité» fort redevable aux compositeurs baroques. Contrairement à la Sonate en fa majeur et à son quasi-continuum de développement, d’un mouvement à l’autre, les mouvements sont donc ici très contrastés et définis: c’est une construction autrement plus tendue, dans l’idiome aminci, rythmiquement très guidé, qui s’était développé en quelques années. Pour une fois, le piano joue un grand rôle et ouvre le premier mouvement par un solo prolongé avant d’être rejoint par l’alto pour un Allegro vigoureux, avec un second sujet plus doux mais guère plus paisible. L’évaporation de cette énergie dans la brusque énonciation, toute en retenue, de la coda est des plus inattendues—tout comme l’éloquence du mouvement lent, sorte de monologue fervent de l’alto contre un glas d’accords pianistiques façon tantôt carillon, tantôt choral. Le finale, qui fait irruption avec des gestes brusquement percussifs aux deux instruments, se développe en un moto perpetuo résolu et exaltant, apparemment (et inhabituellement, pour Hindemith) imprégné d’amples références à la musique d’Europe orientale. Les brillantes œuvres de chambre de Kodály et de Bartók avaient, on le sent, déteint sur Hindemith, qui les avait côtoyées dans les festivals de musique contemporaine. Peut-être en eut-il conscience car ce mouvement est presque unique dans tout son œuvre; ce qui peut expliquer pourquoi cette sonate—par ailleurs magnifique à tous égards—fut la seule du corpus op. 25 que Hindemith laissa inédite après l’avoir créée en janvier 1923. À deux petites exceptions près—la version pour piano de la Trauermusik (1936), en mémoire du roi George V, et la Méditation pour alto et piano de 1938—, Hindemith se détourna pendant dix-sept ans du genre alto/piano. La Méditation est la transcription d’un paisible mouvement extrait de Nobilissima visione, le ballet que Hindemith consacra la même année à un portrait de Saint François d’Assise en prière; les habitués des concerts y reconnaîtront la portion initiale de la suite orchestrale également tirée de ce ballet. Ici, Hindemith se livre à une sorte de distillation de l’idiome de sa maturité, au flux et à la sérénité graves, à l’harmonie fusionnant majeur et mineur en une sonorité richement élégiaque. Cette période n’en fut pas moins extrêmement productive. Tout en travaillant à un projet de ballet sur Brueghel—les futurs Quatre tempéraments, apparentés à un concerto pour piano—, il orchestra certains lieder de son cycle Marienleben (1922–3) et commença d’élaborer Die Harmonie der Welt, un opéra (qui devait rester inachevé pendant près de vingt ans) sur la vie de l’astronome Kepler durant la guerre de Trente Ans. Dans le même temps, il produisit un véritable torrent de sonates instrumentales: une pour cor, une pour trompette, une pour harpe, une pour violon, une pour alto et une pour clarinette, continuant là une série entamée en 1937 avec des sonates pour orgue, pour duo pianistique, pour hautbois et pour basson. Il semble avoir reconsidéré le potentiel expressif des divers instruments solo, car plusieurs de ces sonates recèlent une tension et un drame bien éloignés de l’harmonieuse sérénité de Nobilissima visione. Ce fut donc pendant sa troisième tournée aux États-Unis, dans les premiers mois de l’année 1939, que Hindemith rédigea sa dernière sonate pour alto (la plus imposante, celle qui devait être, aussi, sa dernière composition pour alto solo). Créée à Harvard le 18 avril 1939, cette Sonate pour alto et piano en quatre mouvements présente des affinités inattendues—du point de vue de l’idiome de Hindemith, très abouti—avec la juvénile Sonate en fa majeur: dotée d’un mouvement de «Phantasie» et d’un finale comptant deux variations, elle est plus ou moins centrée sur fa, ni majeur ni mineur mais dans un mélange des deux. (En fait, aucune armature n’est spécifiée, ce qui en a conduit certains à l’appeler, à tort, «Sonate en ut».) D’un autre côté, tout en elle parle avec la voix du Hindemith de la maturité, dans des lignes polyphoniques puissantes, assurées et tenues. Le premier mouvement, déterminé et ardent, est globalement de forme sonate, avec un thème secondaire plus tranquille; aboutissant à un impressionnant climax, il affiche la chaleur émotionnelle accrue propre aux œuvres des années 1930 du compositeur—une chaleur qui, au vrai, imprègne toute la Sonate. S’ensuit un vigoureux Scherzo qui joue sur des longueurs de mesure changeant à toute allure, et sur un slogan rythmique emphatique développé avec beaucoup de ressource et de verve sardonique pendant que le piano fournit des figures façon fanfare et des accompagnements en perpetuum mobile, à moins qu’il ne traque d’un air sinistre l’alto en staccato. Le mouvements lent «Phantasie» s’avère un mélange rhapsodique, de plus en plus dramatique, de récitatif et d’arioso, d’alto étant désormais bien en évidence. Le finale s’ouvre assez affablement et son second sujet apparaît comme une marche miniature. Mais au lieu d’un développement conventionnel, ces matériaux sont traités en deux variations fort contrastées, la première mystérieuse et fantasque (le piano faisant des gazouillis et des passages rapides), la seconde davantage résolue et vigoureuse, poussant la Sonate vers une triomphante conclusion sur un fa à l’unisson. Paul Hindemiths erstes Instrument war die Violine, die er so gründlich meisterte, dass er schon im Alter von 19 Jahren zum Konzertmeister des Frankfurter Opernorchesters aufstieg. Aber gegen Ende des Ersten Weltkriegs hatte er eine Vorliebe zur Bratsche entwickelt, und in den Zwischenkriegsjahren war er sowohl als Kammermusiker—als Bratscher des Amar-Quartetts, das sich auf zeitgenössische Musik spezialisierte—als auch als Konzertsolist international berühmt. (Er gab zum Beispiel die Premiere von William Waltons Bratschenkonzert.) Er schrieb wahrscheinlich mehr Solorepertoire für die Bratsche als alle anderen Instrumente. Abgesehen von einem Konzert (Der Schwanendreher), zwei weiteren konzerthaften Werken (der fünften Kammermusik und der zweiten Konzertmusik) und der Trauermusik für Bratsche und Streicher schrieb er nicht weniger als sieben Sonaten entweder für Bratsche und Klavier oder Bratsche allein. Die ersten Beispiele der letzteren Kategorien sind die vierte und fünfte der fünf Sonaten für Streichinstrumente, die er 1918, als er noch an der Westfront im deutschen Heer diente, begann und als sein op. 11 veröffentlichte. Damals war es eine nahezu unerhörte Geste, so viele Werke in einem einzigen Opus zusammenzufassen, und sie signalisiert, dass Hindemith romantische Einstellungen hinter sich lassen wollte, wie z.B. die Idee, dass jede Komposition ein in sich geschlossenes und total separates Werk war. Zugegeben, Brahms und Reger haben gelegenlich Kammermusikwerke in Paaren veröffentlicht, aber indem er eine solche Anzahl größerer Werke aufnimmt, greift Hindemith auf das Beispiel von Haydn oder sogar Händel zurück und bietet eine Sammlung an, aus der Spieler auswählen konnten. Am 2. Juni 1919 spielte er mit der mit ihm befreundeten Pianistin Emma Lübbecke-Job die Uraufführung der Sonate in F-Dur op. 11, Nr. 4 für Bratsche und Klavier in einem ausschließlich Hindemiths Werken gewidmeten Konzert in seiner Heimatstadt Frankfurt. Das Konzert führte direkt zur Publikation des Werks und einer Assoziation mit dem Schott-Verlag, die lebenslang anhielt. Obwohl es ihr nicht an originalen Momenten mangelt, ist diese anmutige, gefällige Sonate eines der wenigen Werke, das gelegenlich durchklingen lässt, dass Hindemiths Stil in der Welt von Brahms und sogar Dvorák verwurzelt ist. Sie enthält auch eine, womöglich durch das Studium von Debussy (den sein Kommandant im Krieg besonders bewundert hatte) vertiefte, französisch-russische Ader. In der Musiksprache der Sonate gibt es wenig, das ein Publikum in den 1890er Jahren überrascht hätte, obwohl wenige Stücke aus dieser Ära so frei modulieren. Die eher ungewöhnliche Form mit einem kurzen Einleitungssatz, Thema und Variationen und einem Finale, das die Variationenfolge unterbricht, aber später wieder aufnimmt, hat Anklänge an das Genre der Phantasiesonate, die einige romantische Komponisten kultivierten. Die anfängliche wiegende Melodie könnte fast von Brahms stammen, obwohl die chromatische Harmonisierung seines Kontrasubjekts auf Franck weist. Eine kadenzhafte Passage leitet in den Variationssatz über, dessen volksliedhaft gefärbtes Thema stark an die russisch-nationalisische Schule erinnert (etwa Borodin durch den Filter von Debussy). Die folgenden vier Variationen sind jedoch individueller, und der Satz verwandelt sich zusehends in echte Polyphonie. Das Finale unterbricht diesen Prozess: es erinnert an einen in sich geschlossenen Satz in Sonatenform mit zwei kontrastierenden Ideen—die erste bestimmt, mit einer prominenten dreinotigen rhythmischen Idee, die zweite eine Art sanftes Wiegenlied und eine der unverblümtesten romantischen Melodien in Hindemiths gesamtem Œuvre. Nach einer ausgedehnten Durchführung wird die im vorangegangenen Satz begonnene Variationenfolge wieder aufgenommen und mit drei letzten abgeschlossen: einer sanft fließenden, einem lebhafteren Fugato und einer Coda, in der das volksliedhafte Thema das letzte Wort behält. Nur drei Jahre trennen op. 11, Nr. 4 von Hindemiths nächster Bratschensonate mit Klavier, der vierten in seiner Sammlung op. 25 (in dieser Periode stellte er gewöhnlich noch mehrere Streichersonaten in einem einzigen Opus zusammen). Aber obwohl die Sonate op. 25 Nr. 4 für Bratsche und Klavier von 1922 theoretisch noch ein „frühes“ Werk ist, ist—zumindest in den ersten beiden Sätzen—jeder einzelne Takt schon echt Hindemith. In der Zwischenzeit war er in der europäischen Avantgarde mit einer skandalösen Trilogie von Kurzopern, die sich aus verschiedenen Blickwinkeln mit Erotik befassen, berühmt geworden, von deren sensationslüsternem Stil er sich praktisch sofort zugunsten einer neuen „Objektivität“ lossagte, die den Komponisten des Barock viel verdankte. Anders als in der praktisch kontinuierlichen musikalischen Verarbeitung von einem Satz zum nächsten in der F-Dur-Sonate sind die Sätze der neuen Sonate stärker kontrastiert und deutlich definiert: die Konstruktion ist straffer, in seinem schlankeren, eher rhythmisch ausgerichteten Idiom, das sich in den Zwischenjahren rapide entwickelt hatte. Das Klavier spielt eine ungewöhnlich prominente Rolle, indem es den ersten Satz mit einem ausgedehnten Solo öffnet, bevor die Bratsche für ein getriebenes Allegro mit einem sanfteren, aber kaum friedlicheren zweiten Thema mit einstimmt. Das Verpuffen dieser Energie in die plötzliche Untertreibung der Coda ist umso unerwarteter, wie auch die Eloquenz des langsamen Satzes, einer Art leidenschaftlichen Monologs für die Bratsche gegenüber läutenden Klavierakkorden: manchmal glockenhaft, manchmal wie ein Choral. Das Finale bricht mit brüsk perkussiven Gesten in beiden Instrumenten herein und entwickelt sich in ein entschlossenes, anregendes Moto perpetuo. Dies ist offensichtlich (und für Hindemith ungewöhnlich) von ausgedehnten Anspielungen an osteuropäische Musik erfüllt. Man bekommt das Gefühl, dass seine Begegnung mit den brillanten Kammermusikwerken von Kodály und Bartók auf zeitgenössischen Musikfestspielen auf ihn abgefärbt hatte. Vielleicht wurde ihm das bewusst, denn der Satz ist praktisch einzigartig in seinem Œuvre; das könnte der Grund sein, warum er diese—in jeder anderen Hinsicht herrliche—Sonate als einzige des Opus 25 unveröffentlicht in der Schublade liegen ließ, nachdem er im Januar 1923 die Uraufführung gespielt hatte. Hindemith kehrte mit zwei kleinen Ausnahmen—der Klavierfassung seiner Trauermusik (1936) im Andenken an König Georg V. und der Meditation für Bratsche und Klavier von 1938—17 Jahre lang nicht zum Bratsche/ Klavier-Genre zurück. Dieses spätere Stück ist eine Transkription eines stillen Satzes aus seinem Ballett Nobilissima visione aus demselben Jahr über den Hl. Franz von Assisi, der den Heiligen beim Gebet darstellt. Konzertbesuchern wird er auch als der Anfangsabschnitt der Orchestersuite bekannt sein, die Hindemith aus dem Ballett zusammenstellte. Die Musik ist eine Art Destillation seiner reifen Musiksprache, gravitätisch fließend und ruhig-heiter, während die Harmonik mit reich-elegischem Klang Dur und Moll verschmilzt. Aber es war trotzdem eine enorm fruchtbare Periode. Abgesehen von der Arbeit an einem geplanten Breughel-Ballett, das sich zum quasi Klavierkonzert Die vier Temperamente mausern sollte, orchestrierte er einige seiner Marienleben-Lieder von 1922–23 und begann mit den Plänen für Die Harmonie der Welt, einer Oper über den Astronomen Kepler im Dreißigjährigen Krieg (die nahezu zwanzig Jahre lang unvollendet bleiben sollte). Unterdessen produzierte er einen wahren Strom von Instrumentalsonaten: jeweils eine für Horn, Trompete, Harfe, Violine, Bratsche und Klarinette, die eine Serie fortsetzte, die er 1937 mit Sonaten für Orgel, Klavierduett, Oboe und Fagott begonnen hatte. Er scheint das expressive Potential der verschiedenen Soloinstrumente neu überdacht zu haben; und einige dieser Sonaten scheinen eine Spannung und Drama zu besitzen, die sich stark von der harmonisch heiteren Stille von Nobilissima visione unterscheiden. Daher komponierte er in den frühen Monaten von 1939 auf seiner dritten Konzertreise in den USA seine letzte und größte Bratschensonate (die auch seine letzte Solokomposition für das Instrument sein sollte). Diese viersätzige Sonate für Bratsche und Klavier, die er am 18. April 1939 in Harvard uraufführte, besitzt—aus der Perspektive von Hindemiths reifster Musiksprache—unerwartete Ähnlichkeiten mit der frühen F-Dur-Sonate, indem sie einen „Phantasie“-Satz enthält, das Finale zwei Variationen einschließt und das Werk selbst mehr oder weniger um F angesiedelt ist, obwohl weder in Dur noch Moll, sondern einer stetigen Mischung der beiden. (Das Werk gibt keine bestimmte Tonart an und wurde in der Folge oft falsch als „Sonate in C“ bezeichnet.) Andererseits spricht sie ganz und gar mit der Stimme des reifen Hindemith, in starken, selbstbewussten und anhaltenden polyphonen Linien. Der entschlossene, leidenschaftliche erste Satz ist in Sonatenform mit einem ruhigeren Seitenthema gehalten und steigert sich zu einem eindrucksvollen Höhepunkt; er stellt die größere emotionale Wärme zur Schau, die für Hindemiths Werke vom Ende der 1930er Jahre typisch ist und die gesamte Sonate durchzieht. Es folgt ein kraftvolles Scherzo, das mit rasch abwechselnden Taktlängen und einer rhythmischen Floskel spielt, die Hindemith mit großem Einfallsreichtum und bösem Witz verarbeitet, während das Klavier fanfarenhafte Figuren und Perpetuum mobile-Begleitung beiträgt oder die Bratsche mit unheimlichem Staccato umpirscht. Der langsame Satz, die „Phantasie“, erweist sich als eine rhapsodische und zunehmend dramatische Mischung von Rezitativ und Arioso, in dem die Brasche in den Vordergrund gerückt wird. Das Finale beginnt eher freundlich, und ihr zweites Thema tritt als Miniaturmarsch auf. Aber statt einer konventionellen Durchführung wird dieses Material in zwei kontrastierenden Variationen verarbeitet—die erste ist mysteriös und kapriziös mit vogelhaftem Gezwitscher und Läufen, die zweite ist entschlossener und energischer und bringt die Sonate zu einem triumphalen Abschluss auf einem Unisono-F.